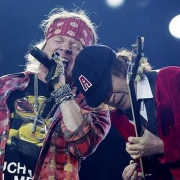 Chris Slade on Axl fronting AC/DC: "It's the best I've ever heard the Band"
Rumor - Is Axl doing a track in the new AC/DC album? Myles Kennedy vs. Axl Rose - "Highway To Hell"
No more AXL/DC? Looks like AC/DC have reunited with Brian Johnson.